My nostrils were buried. I had breakfast in a world which didn’t smell at all. In these two poems, the acclaimed South Korean poet Kim Haengsook focuses on the human face and its excess of meaning in a world where meaning itself is volatile and unstable. The face, always at the center of human relations, can signify the deepest feelings of happiness, loss and confusion, yet its silent vocabulary collides with the world of objects and our desire to communicate with other people. 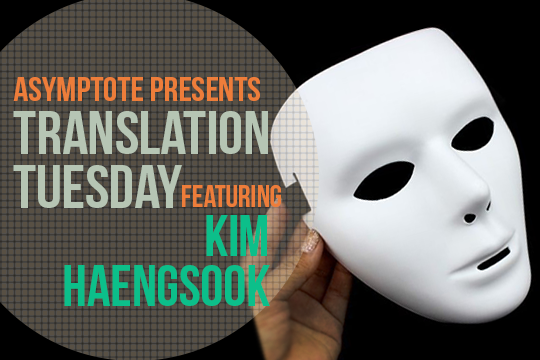 It is a pleasure to feature Haengsook’s thought-provoking work on Asymptote, translated by Lei Kim. The face that stayed with me, like a brother-in-arms, ran away like another brother-in-arms into the skin of the infinite, placid night. And when it clung to me again, the nose was completely flattened, the ears were a series of dreams as they were pulled and hauled. Even though I washed out the dreams with soap, my face didn’t return to its normal volume. My nostrils were buried. I had breakfast in a world which didn’t smell at all. I became clear and trustful. The sunlight that fell on my face. The sunlight. The worn toe-caps that shone in the sunlight of this street. People in their shoes. Like in a swamp, their feet sank first. what possibility do you reach? what do you mean by yourself? Kim Haengsook made her literary debut in 1999 in Contemporary Literature. One of the most prominent poets in Korea, she is the winner of the Nojak Literary Award (2009) and the Chun Bong-Gun Literary Award (2015). She is the iconic master who broke with the lyrical tradition that dominated Korean literature with new poetic styles such as the 2000s’ “New Wave.” She has been much loved both by critics and readers since her debut collection, announcing her as the latest poet belonging to the Korean Futurism school of poetry, alongside poets such as Hwang Byung-sueng, Kim Kyoung-ju, Kim Min-jeong, and Ha Jae-yoen. Her second collection, Capacity of Break-ups, proved that she has a talent which not only allows herself to enter a world of specific sentiments but also invites readers into that world. The Significance of Others (2010, Minumsa) marks a shift from an attentiveness towards dismantling the world and self into mosaic feelings to an interest in the relationship between self and other. The Portrait of Echoes (2015, Moonji) is her most recent collection. Lei Kim is a literary translator. She has translated Lee Jangwook’s poetry collection, Request Line at Noon (Codhill Press, 2016), and received the Modern Korean Literature Translation Commendation Award.